I recently blogged on the theme The Cool is Back in ECM, reflecting on my attendance at two widely varying industry events, the Box.Net BoxWorks conference, and IBM’s Information on Demand. My conclusion, based on my data point of whether my kids had heard of the entertainment (ECM passed the test this year!) is that the Cool is Back in ECM. 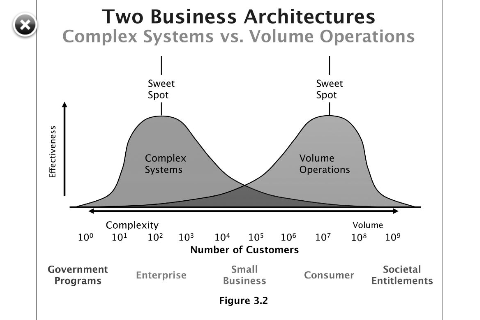 So per this diagram, there are two flavors of content solutions, one focused on a sweet spot that is rich in complexity and depth and focused on a finite customer set with enough scale to take advantage of information complexity and deep analytics (e.g., IBM, Oracle, Open Text, EMC). The second is a set of solutions that have been built from the assumption of simplicity and scale and focus on a very broad customer set (e.g., Box, DropBox, SkyDox, Yammer, Google Docs). And yet even within the dichotomy of this model, there seems to be some nuances and complexities to think about relative to our industry. The kind of scale represented by volume operations and often introduced via a freemium to premium deployment model offers all sorts of value to small and mid-sized organizations that used to be shut out of the content management solutions space. SharePoint started here, working its way into the enterprise initially as a freebie through IT types. Google Docs did as well, starting with individual consumers. Companies like Box and Yammer started here as well, often with customers in organizations frustrated by the limits of their own IT departments. But at the same time, the longer term dynamic has gotten progressively more complex. The volume game initially plays out through the prism of the number of customers, and that lends itself well to the freemium-premium model. But the game in our industry ultimately plays out through the number of seats that someone is willing to actually pay for, and the place for that volume to ultimately be found is among the companies who are often customers on the complex systems side of the house. Thus it creates a need for the volume players to connect themselves to the complex systems game. And if that wasn’t complicated enough, the expectations for simplicity and ease of use and ease of implemention in the volume game ultimately carry over into the complex systems game. Driving prices down for users and creating a demand for simplicity.